Shakespeare & Co. Booksellers: Trendcasting: After Vampires, What's Next? Trendcasting: After Vampires, What's Next? Last week, we took a look at some of the lesser-known (but even more awesome) contenders in the crowded, glammed-up vampire arena. But like all good things -- and pogs -- every trend has an expiration date. So, after publishing gets bored of bloodsuckers... well, where do we go from here? The big contender of the impending angel rush, Hush, Hush promises to scandalize and titillate with the forbidden high-school attraction between moony-eyed Nora and a mysterious young man named Patch -- the latter of whom knows more and can do more than any teen ought to. I'm betting Patch is probably an angel. The star-crossed drama is set against the backdrop of an oncoming war between fallen angels and loyal angels, a battle in which Nora will play a key role. Big-box retailers like Barnes & Noble are betting the house on Hush, Hush, which comes complete with an eerily Twilight-ish cover design; according to PW, a formidable first print run of 250,000 copies is planned. Hush, Hush is out now. Anne Rice pretty much invented the modern, mincing, glammed up vampire. Well, kind of. You can't really see Christopher Lee romancing high school girls, even if he's wearing a bit of make-up right? Kind of hurts your brain, doesn't it? Sure does. (Let's not think about how, in terms of immortal vampire years, Ed Cullen is probably just as old.) I digress. Angel Time is about a hired hitman who is contracted by angels to travel through history and do good deeds. Rice, who found God some time around 1998, has given up vampires for novels based in Christian mythology. Angel Time, which is out now, is expected to be the first of a series, entitled Songs Of The Seraphim. 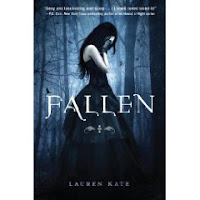 Fallen doesn't hit shelves until Dec 8th, but it's already making waves. The book's pitch -- girl attends haughty boarding school, girl is mysterious drawn to equally mysterious boy, boy turns out to be angel, girl and boy endure supernatural hijinks -- sounds a little familiar (especially if you read the first third of this article). Still, advance buzz says the book has a third act that will hook fans of the genre without fail. Those that are should brace themselves -- next installment of the series won't see the light of published day until Fall of 2010. The hook? He's an angel. High-school nephilim drama!